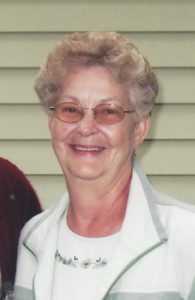 Friday, June 22, 2018 ~ 10:30 a.m.
Judy A. Johnson, 76 of Ashland, NE passed away Monday, June 18, 2018 at her home surrounded by her loving family. She was born July 26, 1941 in Steele City, NE to Dan and Helen (Baker) McCown. She graduated from Beatrice High School in 1959. Judy was united in marriage to Larry R. Johnson on May 28, 1960 in Beatrice. From this union four children were born, Craig, Todd, Penny and Rick. She worked as a Layout Assembly Tech for Telex Communication in Lincoln. Judy was an avid gardener who loved flowers, she liked to travel and read but most of all she loved her family and friends. She was a loving mother and mother to many. Judy was famous for her homemade chicken noodle soup. She was an active member of the First Christian Church, where she was a Deaconess and Elder, on the Membership Committee and a member of the Christian Sisters. Judy is survived by her husband of 58 years, Larry Johnson, children, Penny (Doug) Smith of Lincoln, Rick (Tina) Johnson of Ashland; grandchildren, Cade Smith, Sydney Smith, Alex Guenther, Wyatt Guenther; siblings, Lonnie McCown, John (Roxanne) McCown. She was preceded in death by her parents, Dan and Helen McCown, sons, Craig and Todd Johnson, brothers, Max and Dan McCown; sisters, Cleo Lichty, Thelma Knowles, Jonie McCown. RIP JUDY HAPPY TO HAVE BEEN HELPFUL TO YOU AND LARRY DURING YOUR ILLNESS.MISSING YOU. Words seem inadequate to express the sorrow felt by the loss of your Mother. My heart is with you. Someone as special as your mother will never be forgotten. You are a second mom to me I will miss you so much, love you Aunt Judy ! Condolences to the family. Judy was a very nice and kind neighbor when I lived in town.